We may have found the buildings that will become our monastery. Let me tell you about it, and show off some pictures I took today. You will notice that the weather is incredible – clear sunshine on damp green grass. Just love it!!!! 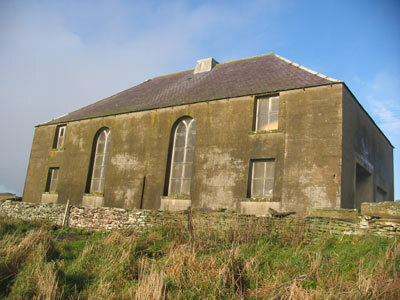 We went out to see an old church and manse that was taken off the market recently due to lack of interest. There was a rainbow on the way out there to get our attention. This is the inside of the old church. 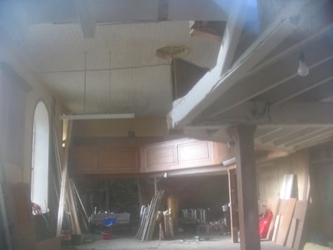 The owner wanted to restore it back to a church again but never got around to it. We think it could be an excellent monastery – new media center, publishing, crafts, teaching, prayer and worship, brewing, etc. There is also a lot of land around it that could easily be rented from a farmer for animals. 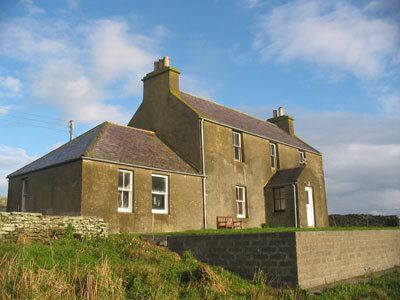 There is also a manse on the property . . . 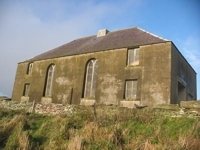 It needs some work, but would be great for accomodation, hospitality, feeding pilgrims, etc. The area is rich in pilgrimage sites . 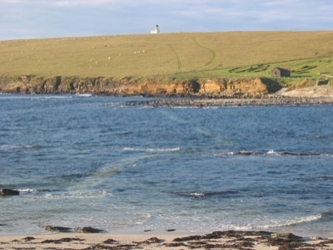 . .
Just over a mile away is an old Celtic Pilgrimage site called the Brough of Birsay. You can see the remains of the chapel on the right. 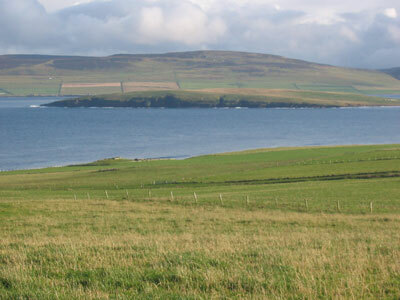 Its possible that St. Magnus was trained by the monks in the monastery here back in the 12th century. The sign says that the pilgrims stopped coming here a few centuries ago. Maybe its about time to open it up again and begin to pray into it???? 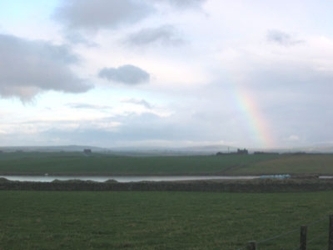 Down the road, a few miles south, is EynHallow (Holy Island), another famous Celtic pilgrimage site. You have to take a boat out to this one. So, I am trying to contact the owner who is in Australia. He was asking £168k, but then it didnt sell at that price so he might be flexible. We actually don’t have any money right now, so i hope he is REALLY flexible, or REALLY patient. Either way, we would appreciate prayers . . . Awesome pictures Andrew, and I also want to pay this place a visit one of these days. As someone who is feeling increasingly called to do exactly what you are doing (founding a monastery), I am now following your journey with great attention. Prayers too. Peace. consider it prayed a bunch from here in indy. i can’t wait to see what god has in store for you all! much love-take care! Maybe the owner likes to give gifts? We are praying the owners are giving discerning people. Andrew the place is divine! Don’t worry about any of the pieces in the puzzle, for GOD will put it all together if it’s HIS will for you to have this place. The pictures are great. One gets a sense of the continuity of the a spiritual journey started centuries before by many others on the same quest. I will pray that GOD makes it perfectly clear if this is the place HE wants for you. Blessings upon blessings to all the family. Exciting. We are in prayer. Perhaps some online fundraising is in order? At least for a downpayment. I’ll help. Yeah, Andrew, let us know how we can help out financially. The blogosphere will answer the call! the lewins will come too! just like field of dreams…if you build it they will come! tell all the kids and deb hello! i also have a little brother born in 1970! you’ve reminded me to pray for him ! praying he’s not just flexible, but generous! it’s beautiful andrew – your vision is so clear i can almost taste it! Previous Post (p)	Hope for USA?